*On the next screen you will be able to choose your two teams or enter your text. The NFL and College Football teams will load into your grid with the team name and logo. 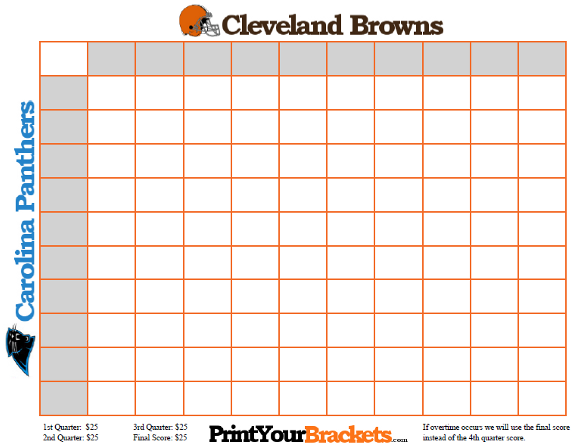 Below is a sample output, where a 100 Square NFL Grid was chosen from the form above. On the next page the Cleveland Browns were chosen as the top team and the Carolina Panthers were chosen as the left column team. Since the person running this pool is a Browns fan, they chose orange as the color of the squares. The payouts for each quarter were entered and a couple lines of notes were also added(both of these features are optional, and if not entered, the area will just be blank white space).